The RCCQ-A Rainshow'r Shower Filter uses specially formulated KDF to convert chlorine into a harmless soluble chloride. The RCCQA Filter reduces dry skin, and scalp, reduces fading for color treated hair, and makes your skin healthier and younger looking! The RCCQ-A Filter is made with ABS plastic. 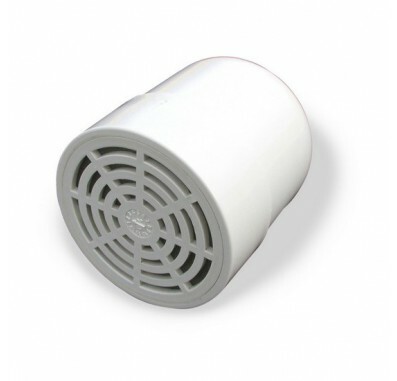 The RCCQ-PC filter is the clear, polycarbonate alternative. Both filters are replacement filters for the CQ-1000 system. The Rainshow'r Shower Filter is tested and Certified by NSF International Against NSF/ANSI Standard 177 for the reduction of free chlorine. Replace the RCCQ filter approximately every 6-7 months. The filter replaces in seconds! The Rainshower Filter contains crystalline quartz for better lathering and energy enhanced shower feel! The Rainshow'r Filter System reduces sediment too!